Among the Kodachrome slides that belong to my mother in law are several from a trip to Washington, DC. Guessing from a number of clues among the entire set of slides I scanned, I think they’re from about 1948. Certainly no earlier than 1947, and no later than about 1953. The buildings on the left are a grassy area today. The buildings on the right have given way to Constitution Gardens and its pond. These buildings remind me of other buildings I’ve seen only in photographs that were built hastily as office space in support of World War II. The Vietnam War obviously hadn’t happened yet, but it would happen, and eventually the Vietnam Veterans Memorial would be built beyond the buildings on the right. Finally, the National World War II Memorial would be built some 55 years hence, replacing the small pool before the Lincoln Memorial Reflecting Pool. Looking east toward the Capitol, you can see that most of the Smithsonian museums haven’t been built yet. More of those anonymous-looking buildings stand beyond the Smithsonian Castle at center right. That’s where the Hirshhorn Museum, the National Air and Space Museum, and the National Museum of the American Indian would eventually go. One last Kodachrome from atop the Washington Monument shows Virginia Avenue and the Potomac River. The set of buildings in the bottom right corner is the Department of the Interior. 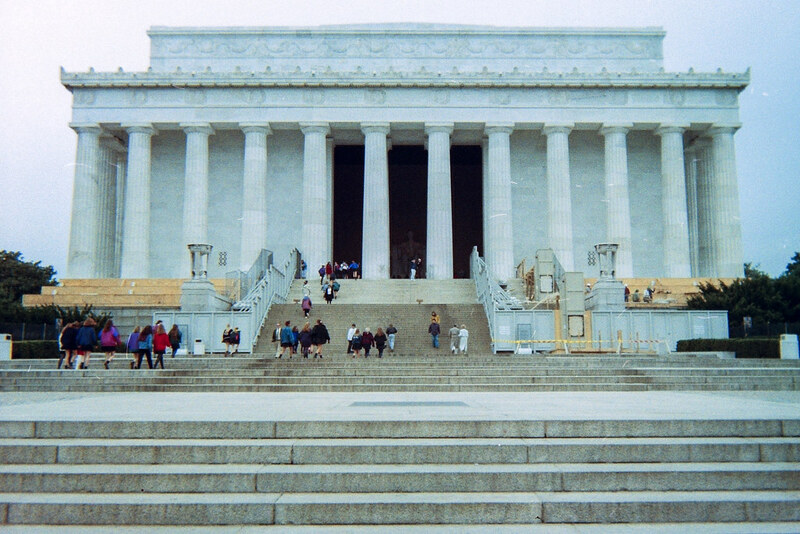 Unbelievably, on my 1993 trip to DC I came upon what remained of the shoot. I didn’t know what movie it was for at the time, of course. But I did photograph enough of the scene to prove now that it was Forrest Gump. Check the TV truck in the lower right of the photo above. It’s in my photo below, lower left. On the ground that summer day in 1993, I wondered why a television station would use such an old truck. And then I noticed the construction debris, and wondered if I’d wandered onto a set being struck. It was exciting to see Forrest Gump in the theater and realize I’d missed this scene’s filming by probably only a couple of days. 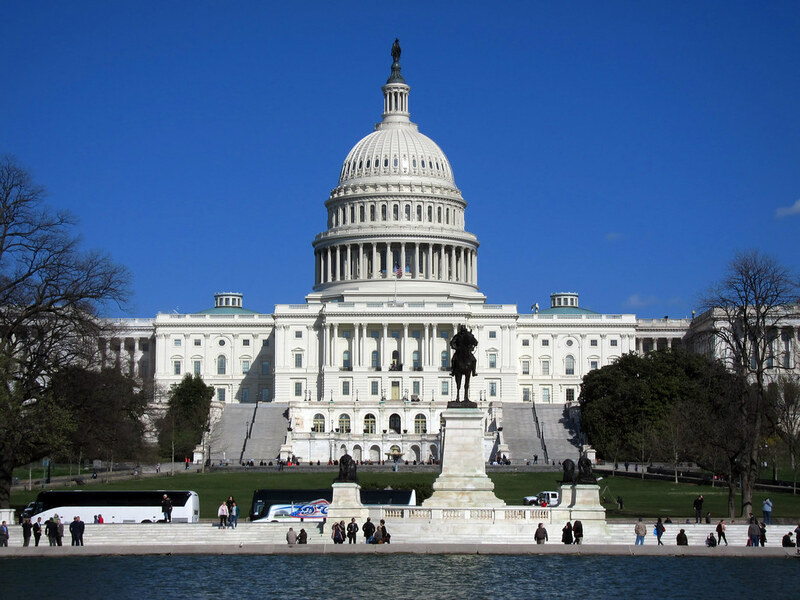 When you shoot the US Capitol straight on, you discover that the Ulysses S. Grant Memorial isn’t centered before the dome. My OCD is most displeased. Since 1967, a carousel has entertained children (and, I suspect, many adults) outside the Smithsonian Castle on the National Mall in Washington, DC. This carousel is the second on this site, having arrived in 1981. It has quite a history. It was built in 1947 for a Maryland amusement park — a segregated park, no African-Americans allowed. The park was desegregated in 1963 on the same day as the march on Washington where Dr. Martin Luther King, Jr., spoke. 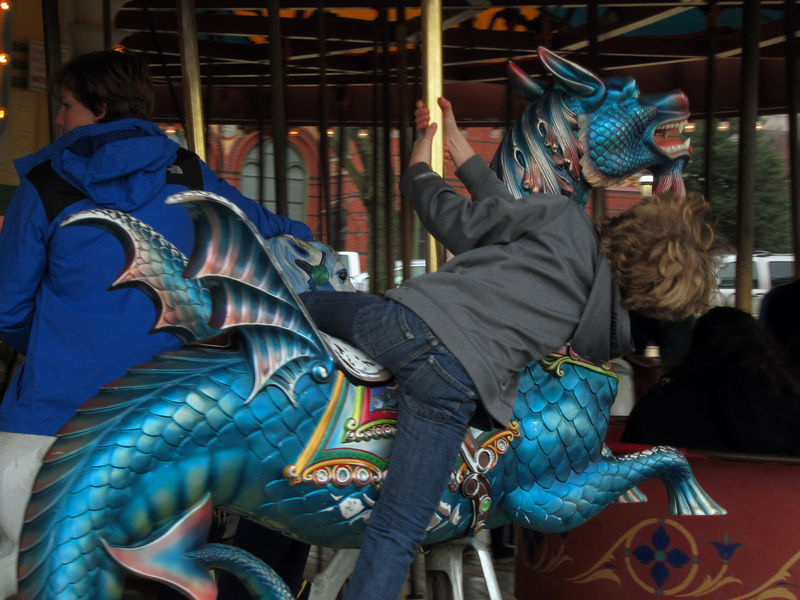 This dragon was added to the carousel in 1996. This kid was thoroughly enjoying his ride on it! 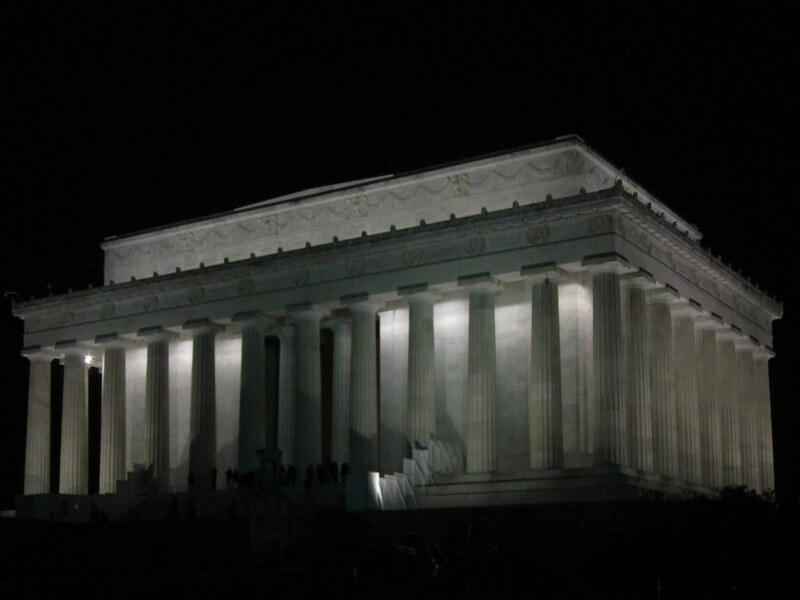 The Lincoln Memorial is at its most stunning at night. It is carefully lit in a neutral bright light. 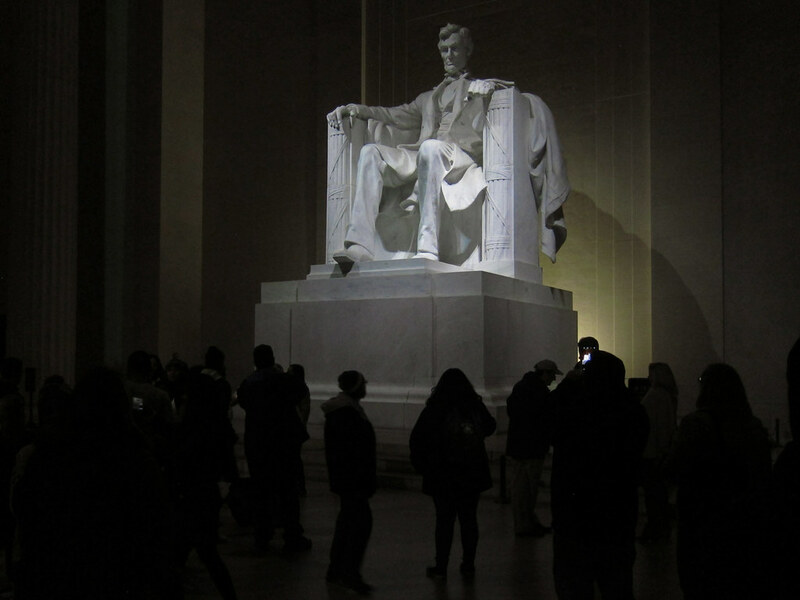 Lincoln himself is lit in cooler light, and it highlights him. That and his immensity draw people to him. 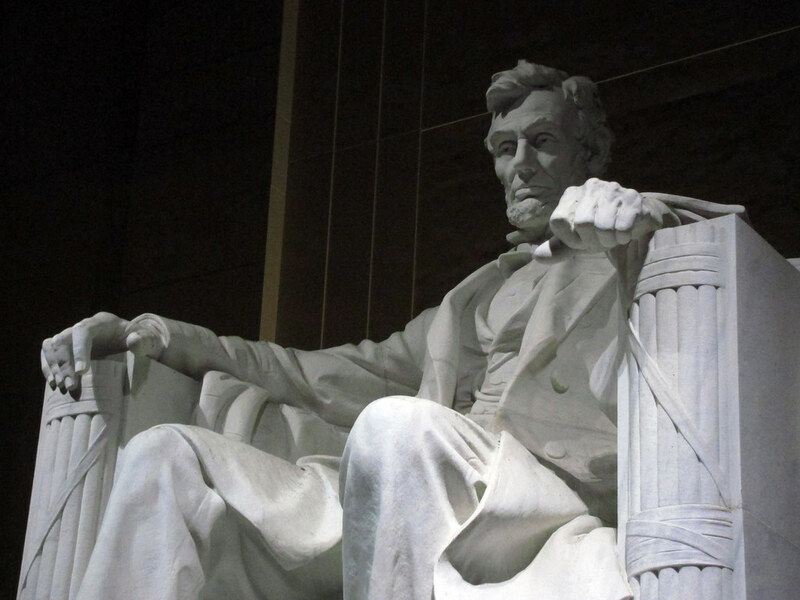 If you see nothing else at the National Mall, see Lincoln. He really is compelling. His space is remarkable, too, especially at night. The signs all ask for visitors quiet reverence, but even when they ignore the signs the space’s stark airiness creates that reverence in you. 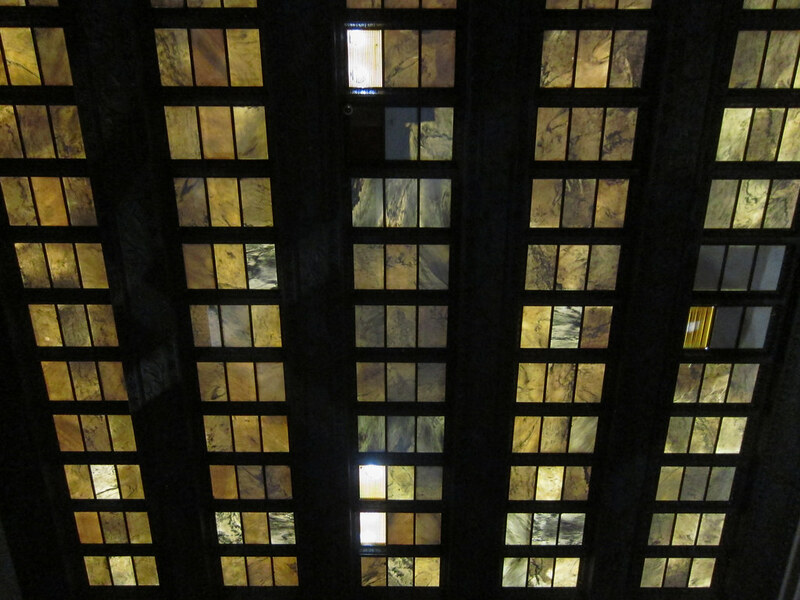 The glass ceiling tiles are the only light that isn’t neutral or cool in this space, and they stand in contrast. 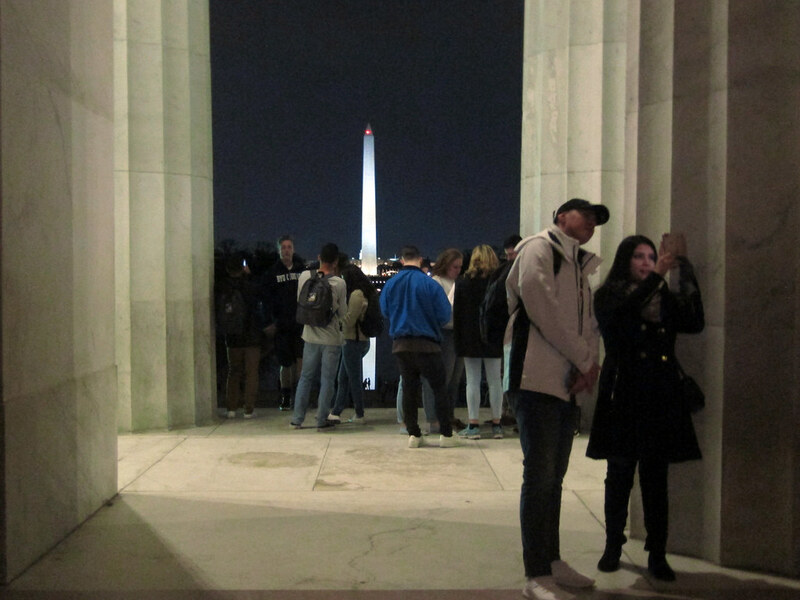 From here it’s easy to see the Washington Monument, itself lit in the night. 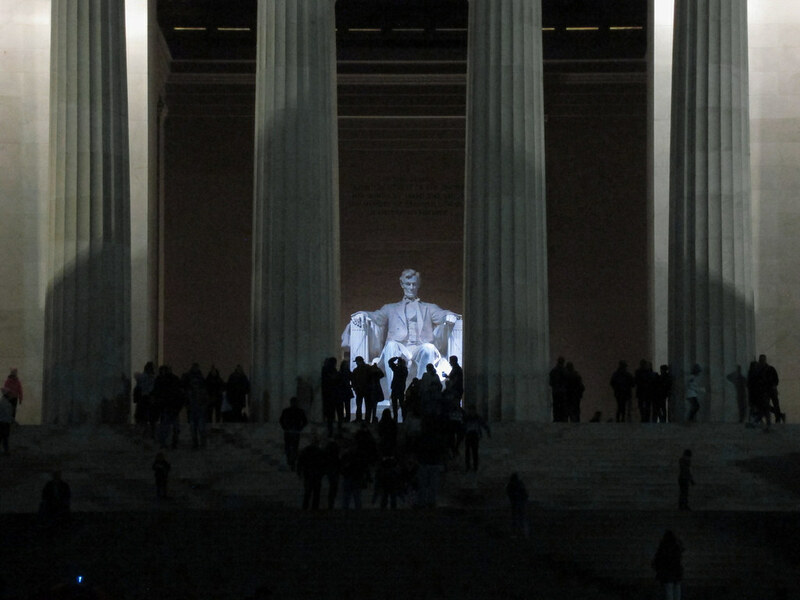 A photoessay: a series on the Lincoln Memorial at night. 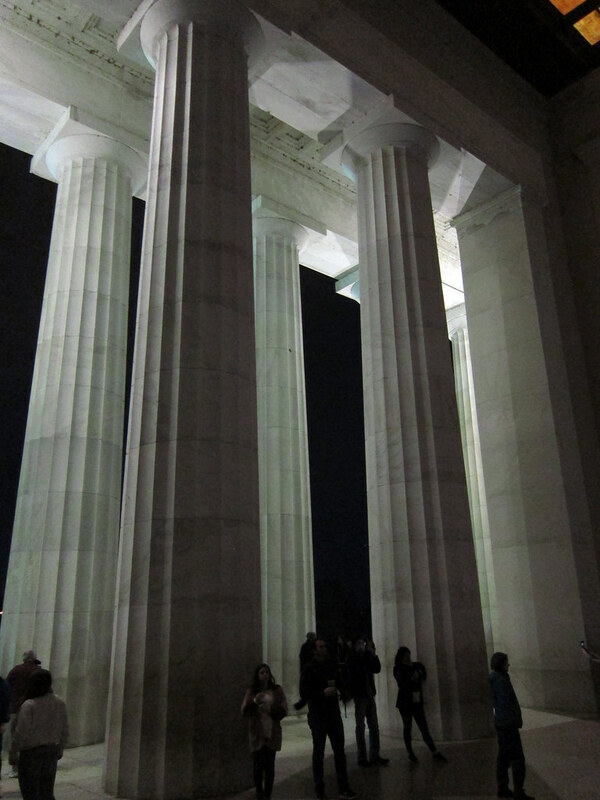 This is when the memorial is at its most stunning. I’m not easily moved by memorials, but the Vietnam Veterans Memorial brought me to tears the first time I saw it. 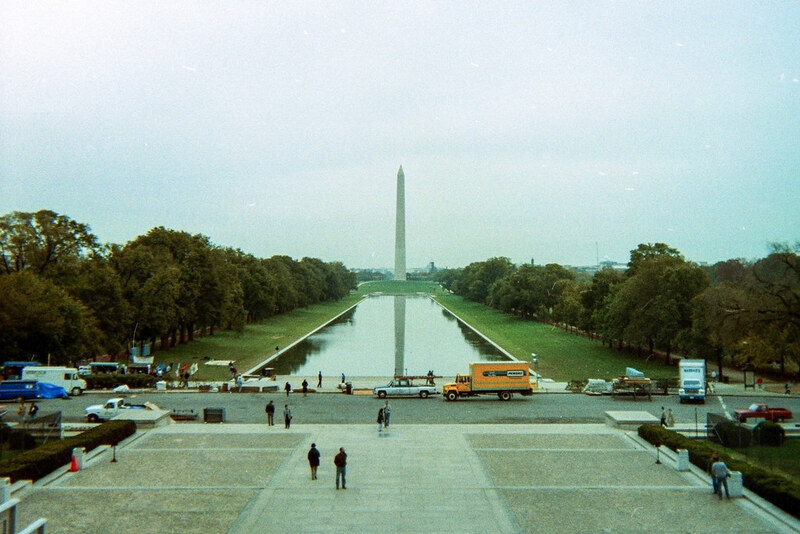 That was on my first visit to Washington, DC, in 1993. I was small when the Vietnam conflict ended. My main memories of it are the news bulletins that kept interrupting Captain Kangaroo, telling of cease fires as the conflict sputtered to its end. I hadn’t even a vague idea of how this war split our country. I didn’t learn of it until middle-school history class, and by then it was 1980. 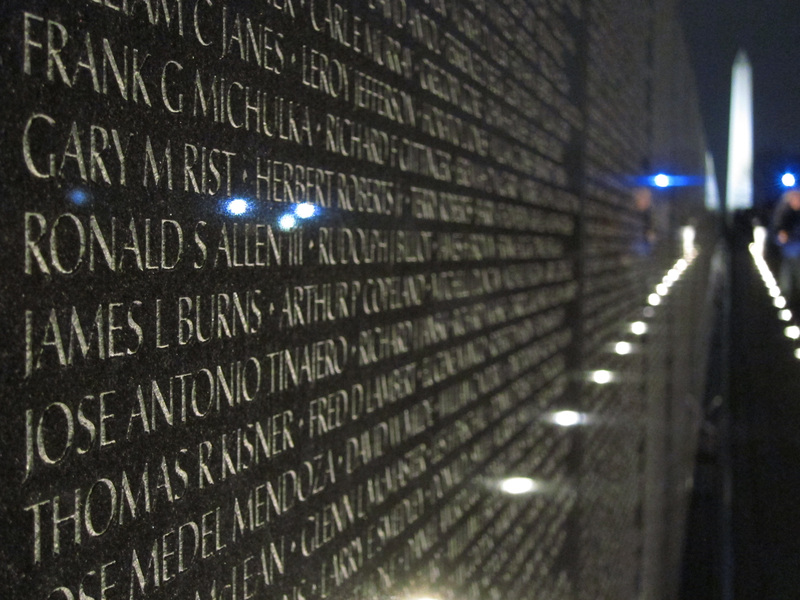 But to see the names, in excess of 58,000 — it brought directly home to me what an enormous loss this conflict created in our country.